AUBURN HILLS, MI — Is it the offseason yet? For the Knicks, it might as well be since from their play it’s become quite apparent they no longer care. This is what a broken team with no confidence, pride nor sense of duty in what they do looks like. At this point, predicting how a Knicks game will go is quite easy. They’ll jump out to a quick lead (this time 14 points), blow it as soon as they get, and let their defensive woes get them blown off the court in the fourth when they fail to get stops. Oh, and let’s not forget letting someone on the oppoosing side notch a career-high in some category. BACKCOURT TRASH: Our starting backcourt of JR Smith and Raymond Felton was absolutely woeful with both going scoreless for the entire first half. JR managed 16 points for the game, but that was only due to gunning when the game had already been decided in the fourth. They shot a dismal 6-26 for the game. Iman Shumpert (5 points, 2/7) and Tim Hardaway Jr. (0 points, 0/6) couldn’t provide much of a spark off the bench, either. ANOTHER GUARD GOES OFF: During this losing streak, we’ve seen the likes of Stephen Curry (triple double) and DJ Augustin have monster games. 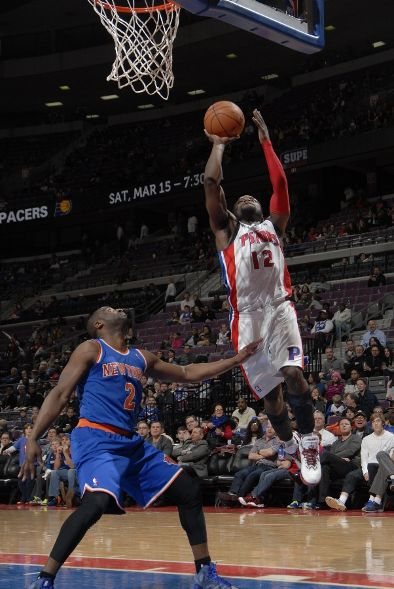 Last night Will Bynum got in on the fun, scoring all of his 16 points in the fourth quarter. Opposing guards seem to realize by the start of the fourth that our guards can defend and start picking us apart. LATEST CAREER HIGH: Andre Drummond was a beast last night. Aside from schooling Amar’e Stoudemire in the paint during the third quarter (six straight points on various spin moves), he pulled down a career high 28 rebounds. STAT N’ MELO: When it came to offense, New York only got consistent production out of these two. Stoudemire scored 22 points and Melo added 28. While their shooting percentages were strong, the ball movement wasn’t consistent, so a good bulk of their points had to come through isolation plays. WOODY: Raymond Felton continues to get paraded out for heavy minutes despite being a clear detriment on the floor. Felton played 32 minutes, going 1/9 from the floor (4 points). Any competent coach would have benched him a long time ago for Prigioni and Toure Murry, who can’t possibly do any worse. We’ll see if the Knicks can make the bleeding stop on Wednesday when they head to the Target Center to face the Timberwolves.